Spanish painter. Next to nothing is known about Felipe Ramrez, except that he worked in Toledo, where he was named one of the painters of the archdiocese in 1632. His only known signed and dated figurative work, Christ of the Sorrows, dating from 1631 (private collection) is a copy of an undistinguished late 16th-century painting in Toledo Cathedral. This does not prepare the viewer for his outstanding artistic performance in his still-life (Still Life with Cardoon, Francolin, Grapes and Irises, Prado, Madrid), his only known signed and dated work of this type. 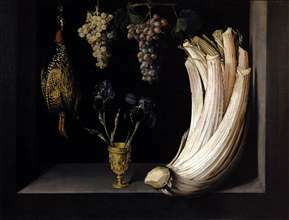 See more details about "Still Life with Cardoon, Francolin, Grapes and Irises"